Sylvan Library is a card that many players love, one of them is fellow Flippin’ Orbs host Grant Casleton. So i decided to write a couple of words about my thoughts about the card. First of all I’m going to say that I’m not a big fan of just putting in Sylvan in every deck that has green mana. Because if you don’t have a specific plan for it, I actually don’t think it’s good enough. Let’s start by breaking down what the card actually does. It costs you two mana and it doesn’t do anything when you cast it, you first need to wait a whole turn until it does something. If it survives though, it will let you see two more cards that turn and it lets you choose the best out of three cards. That’s pretty good, but is it worth going down a card to do so? Also, Natural Selection does the same thing except it cost one mana less, you can cast it at instant speed and it also lets you reshuffle if you don’t like the top three cards. After the first draw however, Sylvan Library let’s you see one new card every turn and choose that one instead of the two remaining cards so it effectively can remove two bad draws which absolutely can be nice. So both cards have upsides compared to the other. But back to Sylvan Library. After the first turn you only see one new card every turn, so if you didn’t like the other two it’s exactly as drawing one card every turn and the Library doesn’t actually do anything anymore. So to recap, it lets you rearrange three cards and negate two bad draws for two mana. I’m not sure that is actually worth spending a card on most of the time. So when could that effect be good enough to spend a card on? I would say it’s good in a combo deck, as those decks usually just want to find a couple of specific cards and do not care about card advantage as much. This is why the ability to “dig” two cards deeper is good in a deck like that. And then one last thing, the card is horrible in multiples so a deck can’t contain too many of them. But Sylvan has one more ability that we haven't touched on yet and that is that you can pay 4 life to draw a card. So for 4 life the card replaces itself and you get the other effects for "free". Now we’re talking! But 4 life can be a lot in some matchups so it’s not always a choice you can make. Against some decks though, you can draw even more cards and that’s when Sylvan Library really shines. The question is if it's worth a slot in every green deck just because it can be good sometimes against some decks? After reviewing the card like this I do not think of it as a card good enough to be worth a slot in most decks. If you are looking for a specific card or want to use it in the sideboard against control to outdraw them for the win, then maybe. There are of course a couple of other situations where Sylvan Library can be good and that is in combination with other cards. 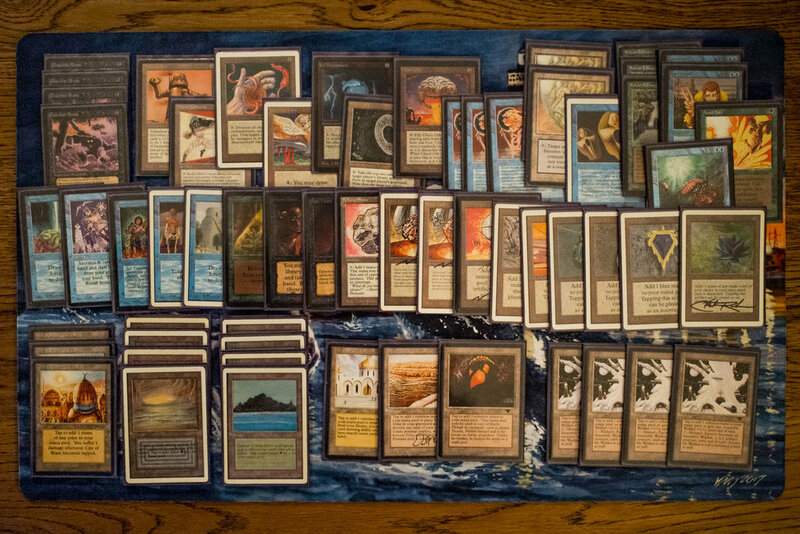 In other formats like Legacy and Vintage Sylvan Library is a lot better than in old school and the reason for that is the fetch lands which lets you shuffle your library. Because if you can shuffle your library you can see three new cards after you’ve drawn the best out of three the turn before. Of course this principle is also true in old school, we just need to find other ways of shuffling the library. A few examples are Demonic Tutor, Timetwister, Transmute Artifact, Land Tax and Untamed Wilds. If you play a couple of them than Sylvan can absolutely be a good card. Another cool combo is to pair it with Millstone. That way you can take the best card out of three, mill away the other two and then see three new cards next turn. So for two mana each turn you can dig through your library quite quick to look for the cards you need. The last couple of cards that interacts with Sylvan in a really good way are Sindbad and Petra Sphinx. These cards let you draw additional cards each turn as long as you are lucky and just happens to have the right card on top of your library. But if you pair them with Sylvan Library you can skip the luck part as you will always know what's on top of your library. It will probably be a land if you have Sindbad in play. Edit: No actually, one more thing. I did forget that Sylvan Library also of course combos very well with Mirror Universe as you can get back all the life. It's so good it even has it's own deck. Also other life gain cards like Ivory Tower and Diamond Valley is quite good with Sylvan as it then lets you convert the life into card draw. That was some random thoughts from me and I probably missed something or said something stupid, hehe. 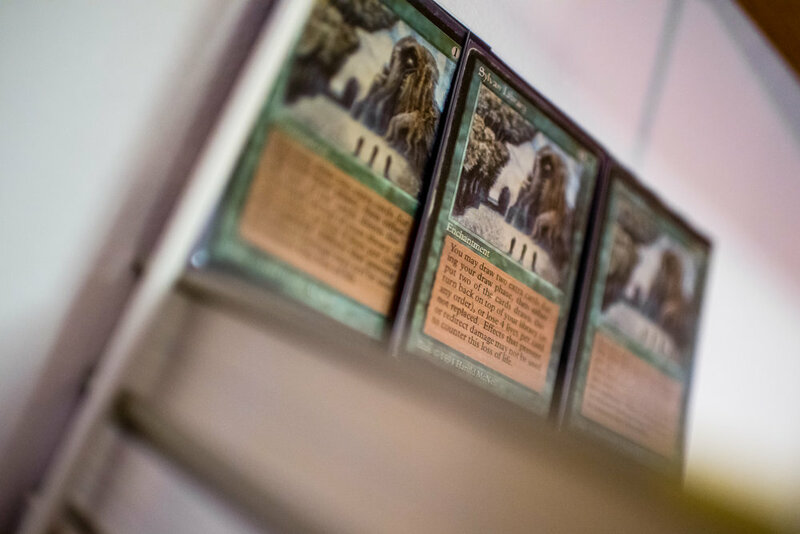 My meaning of this blog post wasn't to say Sylvan Library is bad and you should stop playing it, I just want you to think twice before putting it in a deck. What do you think about Sylvan Library and in what decks do you think it's great in? Use the comments below to share your decks and thought. And to wrap this up, here are a couple of decks I've built that utilises Sylvan Library in different ways. One new Guardian Beast combo deck that I haven't published before.